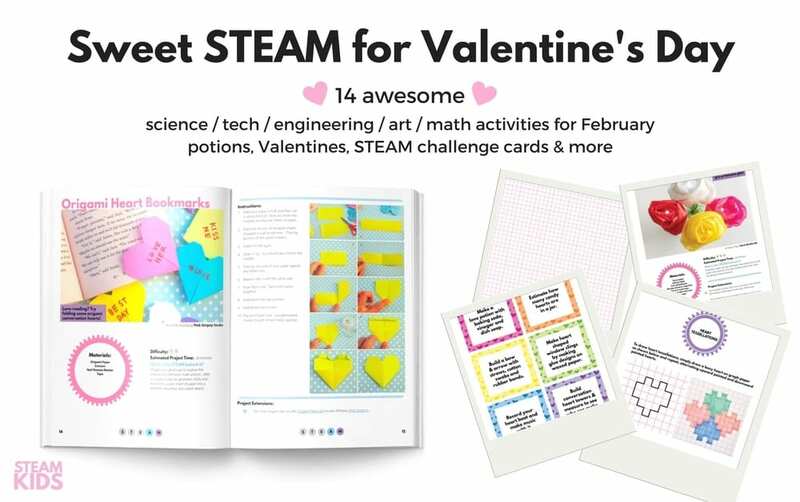 Math can be fun even on Valentine’s Day when you do your STEM activities and math using conversation heart manipulatives! 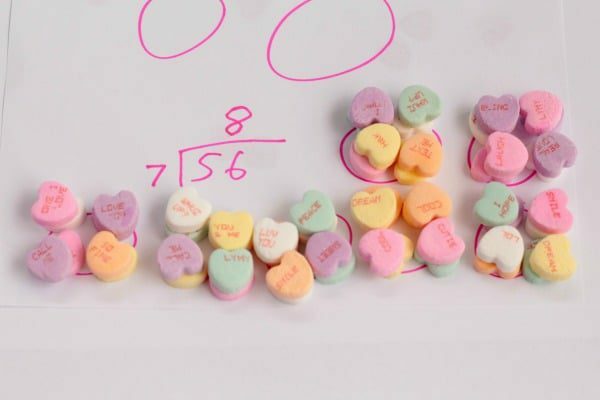 Valentine’s Day math is so sweet! 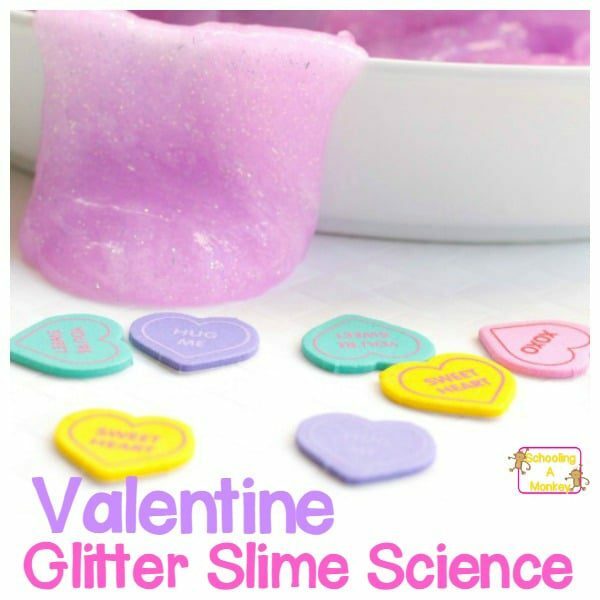 We always buy conversation hearts around Valentine’s Day, but to be honest, we don’t really like to eat them as candy. We’re not huge fans of the chalky, powdery texture and bland flavor. 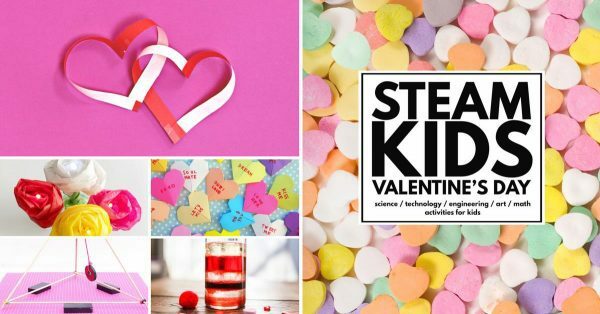 But you can’t have Valentine’s Day without conversation hearts! So, what can you do with them? Use them as math manipulatives, of course! 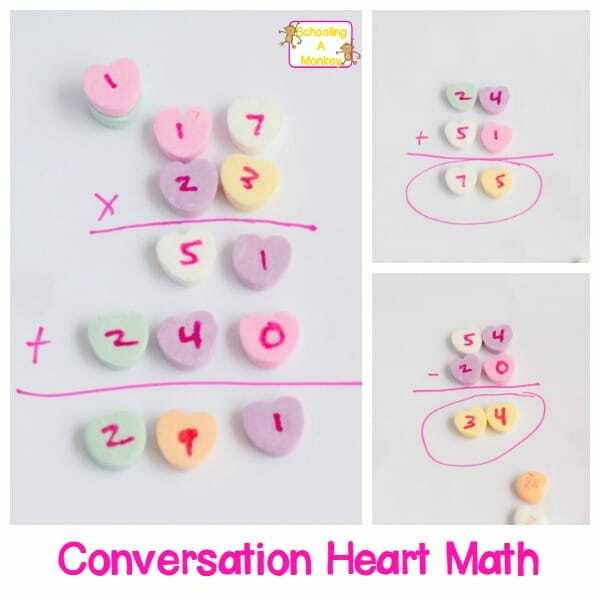 We used our conversation hearts to make our Valentine’s Day math more fun. We played with division, multiplication, subtraction, and addition! Everyone was able to get in on the mathy fun. 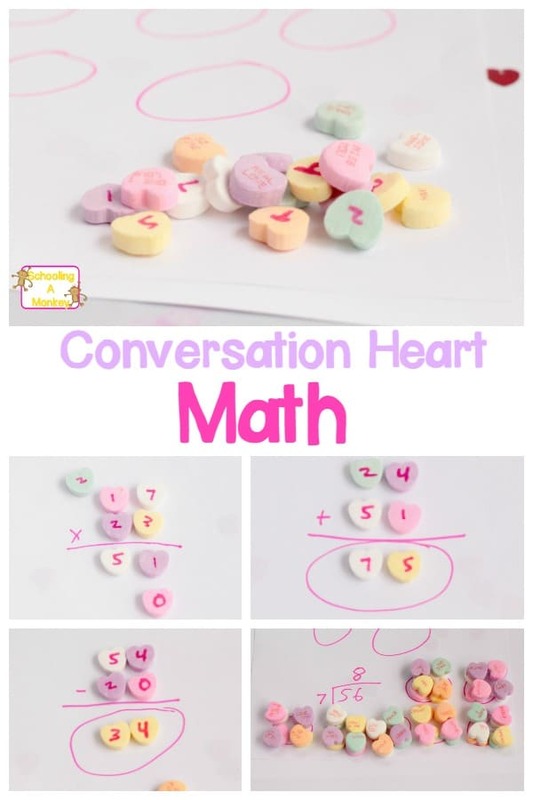 Use our ideas as a springboard to make your own Valentine’s Day math with conversation hearts. You can use the hears for grouping, finding common factors, graphing, building shapes, counting, and a whole lot more! Math is a lot more fun when you can eat your manipulatives! 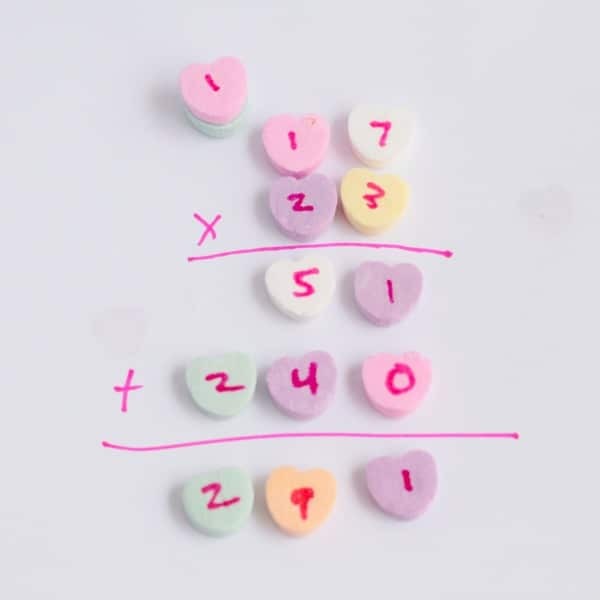 Before starting your math problems, write the numbers from 0-9 on the back of conversation hearts using a food-safe marker (if you want the kids to be able to eat them). You’ll need a lot of numbers, particularly if you are working on multiple digit addition, multiplication, or grouping. We found one large bag of hearts was big enough for almost every math problem we wanted to do. If you get into the multiple hundreds, however, you won’t be able to do grouping problems with just one bag of hearts. 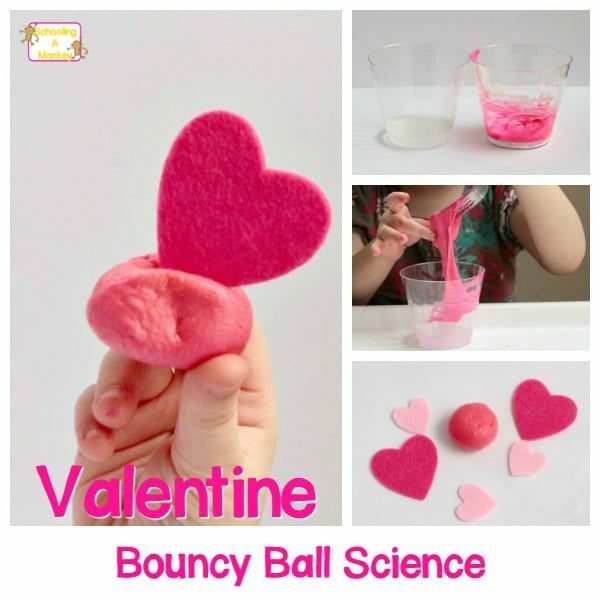 Give each kid an assortment of conversation heart numbers and some scratch paper and a pencil. Monkey was practicing multiple digit addition, so we created some quick problems just to get her brain working before we moved onto harder stuff. Our subtraction problems were pretty straight forward. 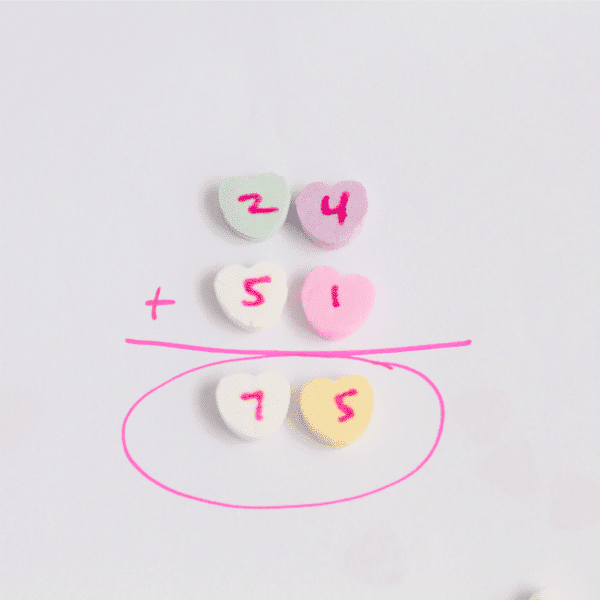 If you need to borrow a number in your math, we just put a little heart off to the side above the other conversation hearts to indicate we were borrowing. Monkey is working on multiplying multiple digits, so I made this quick problem up for her. She loved using the hearts rather than just writing down the numbers. 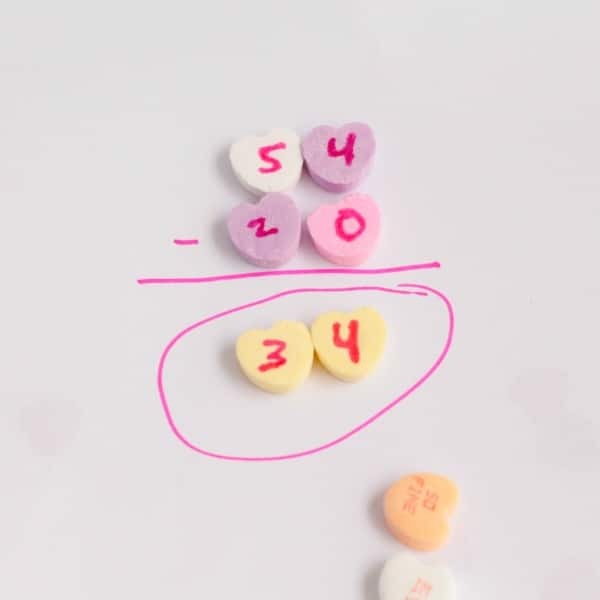 Monkey solved this division problem using grouping, but you can also solve division problems the regular way using conversation hearts as well. 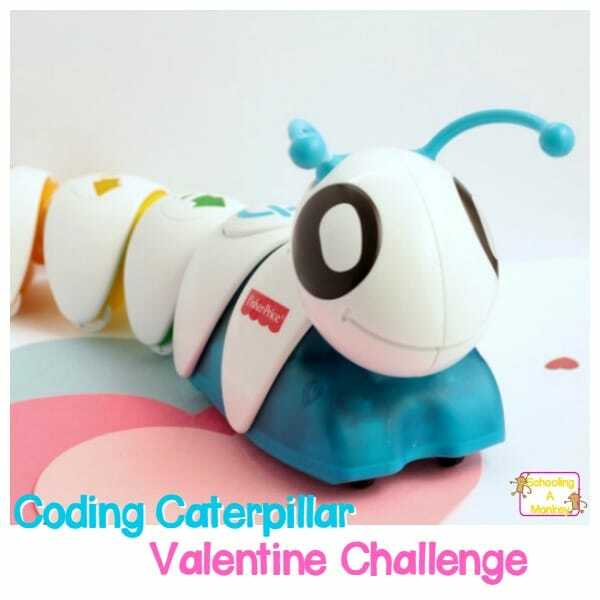 There are so many ways to use conversation hearts to learn!